The Galloglass – Do You have the Warrior Gene? Have you ever heard the term ‘Galloglass’? 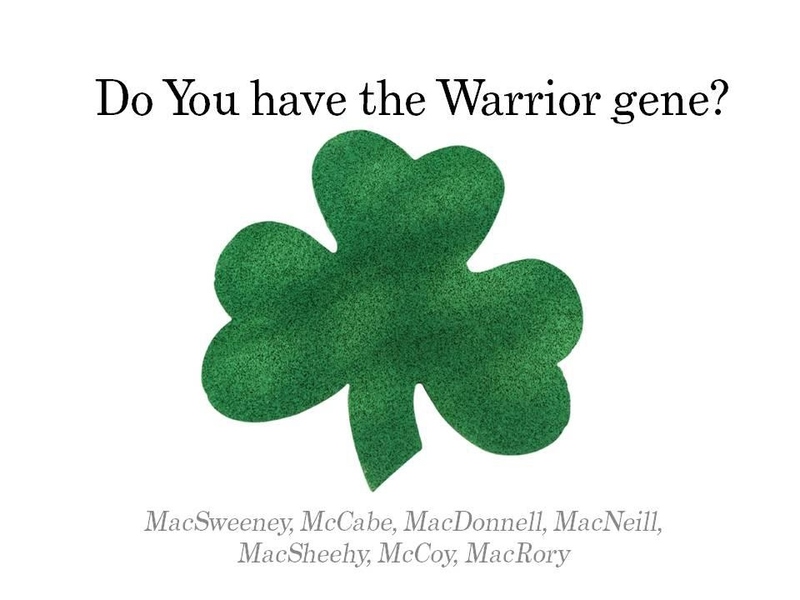 Do you or your Irish ancestors have the surname MACSWEENY, MCCABE – or, MACDONALD, MACNEILL, MACSHEEHY, MCCOY, MACRORY? Then these Scottish-sounding names may mean that you may have “Galloglass” blood in you. After the arrival of the Normans in Ireland in 1169 the Irish Chieftains needed help to halt their advances – as the Norman’s superior arms, armour and tactics were superior to anything the Gaelic Chieftains had. They turned to the Galloglass or ‘foreign Gaels’ – a band of elite warriors from the Hebrides Isles of Scotland who were of Norse/Scottish descendancy. The first Galloglass arrived in Ireland in 1259. They fought like the Normans in mail coats and iron helmets but carried two handed axes and swords. These mercenaries were soon in demand from the warring Irish Chiefs. The McCabes and MacSweeneys were so successful that their clans transplanted completely to Ireland while others such as the MacDonalds, MacNeills, MacSheehy (often just called Sheehy), McCoys and MacRorys maintained their lands in Scotland as well as establishing new territories in Ireland – especially in the Ulster area. This wave of arrivals in Ireland from Scotland were very distinct to the later plantation settlers who started to arrive in the 15th century. Do you have the Galloglass warrior gene? An Irish Placename Travels Abroad to the City of Baltimore. I have now found that my mother’s family, McCabe, came from Scotland into Ireland as warriors. Did they settle in Kildare?